Part of the dramatic new front design of the DS (and ID) that was introduced in september 1967 (model year 1968) was a new bonnet. The picture on the left shows the bonnet of a 1958 ID19 (dark green) behind the bonnet of a third nose DS. 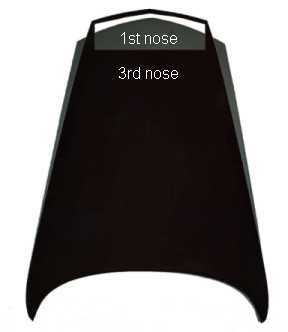 The 3rd nose bonnet is clearly narrower at the front and also a bit longer.